Last time, we introduced a couple of beginner-oriented guides at XDA-University. They’re guides that aim to get new users familiar with XDA and Android and hopefully act as stepping stones to things a bit more complicated yet a whole lot more rewarding. Such activities include modifying and tweaking your Android device, installing new and improved custom roms, and incorporating scripts into the device’s operation. Today, we’ll be talking about how to go about such activities, and how to recover from the dreaded bootloop if things go wrong. If you would like to mod or or tweak your device or install a new rom or script, it’s more than likely that the process involves ‘flashing,’ whereby you load or install the mod, tweak, ROM, and script onto your device through ‘recovery’ or OEM tools. The Android Flashing Guide found at XDA-U does a great job at detailing the different methods, and particularly how to flash roms and kernels with Clockwork Mod Recovery and TeamWin Recovery Project. However, the guide doesn’t cover the installation of mods and tweaks, as they may require additional actions to be perform if the creator says so. This shouldn’t be a problem, as flashing is a pretty universally unchanging action with a process that can be applied to almost any flashable file. The Android Flashing Guide also breaks down the process of flashing with OEM tools such as Motorola’s RSD Lite and Samsung’s Odin into simple, straight forward steps. Links to downloads of these tools are conveniently provided, as well as steps to troubleshooting if things go unplanned. Finding the cause of the bootloop and acting towards the appropriate fix. Potential causes may include improperly flashing a rom, restoring a system only backup, after installing an incompatible mod or theme, and setting the wrong permissions for system files. 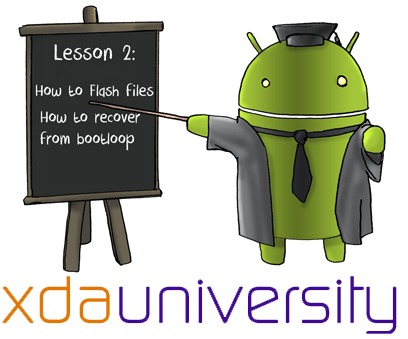 This chapter provides the known fixes for bootloops under such situations. Using a CWM (Clockwork Mod Recovery) zip file as a solution. Applying only to mods as the causation, this fix consists of replacing every file in the mod’s flashable zip file with the original files that they replace. Original files can be found in their respective directories of your original rom. This zip file is then to be flashed back onto your device. Using ADB (Android Debug Bridge). This chapter can be seen as an extension of chapter 2, involving a CWM zip file being flashed onto the device. Since the zip file must be on the SD card in order to be flashed with CWM, some users of devices that do not support SD cards may not be able to complete steps outlined in chapter 2. Chapter 3 aims to guide users through the steps required to flash these CWM zip files through ADB, along with explanations as what happens during the process. In the rare occasion that all three methods do not work, it’s probably best to flash a stock rom, which in most cases is not a zip file, and go on your merry way from there. So there you have it. You now know how to essentially flash mods, tweaks, roms and scripts onto your Android device, and how to recover from a bootloop. These may seem like complicated processes, but once the nerves are calm and after a bit of practice, flashing and bootloops will be a piece of cake. More details can be found in the respective guides at XDA-University, and if there are still any questions left unanswered, you can always query the wealth of guides and ‘how-to’s found in the XDA forums. If you would like to contribute to XDA-University or get involved in any sort of way, feel free to contact us.